Save $5,000 A Year On Your Taxes! We're always looking for ways to help small business owners keep more of their hard-earned dollars and recently came across an exciting program that does just that: BizPlanNOW. BizPlanNOW is a tax-advantaged benefit program that saves small business owners an average of more than $5,000 a year. We're offering this program through a partnership with TASC (Total Administrative Services Corporation), a national third-party benefits administrator. You are able to deduct 100% of federal, state, and FICA taxes for family health insurance premiums and out-of-pocket medical, dental, and vision expenses. All expenses are deducted through the use of an IRS Section 105 Health Reimbursement Arrangement (HRA). The key benefit is that you can declare family medical costs as business expenses, rather than personal deductions. On average, clients save more than $5,000 a year. BizPlanNOW comes with both a deduction and full audit guarantee. Take a moment to view the short presentation and learn more about BizPlanNOW. 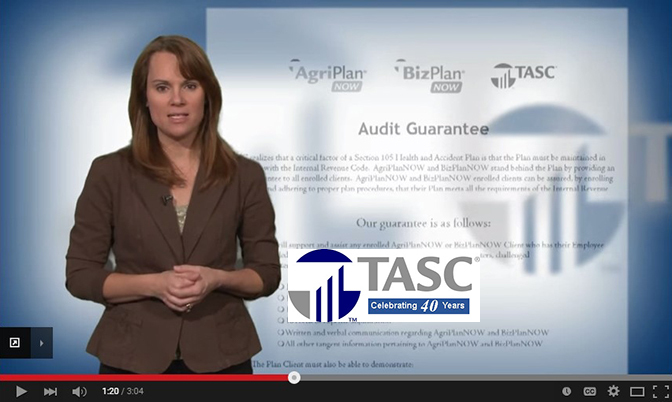 At the end of the video you will have a chance to enter a few pieces of information to have a TASC representative contact you about BizPlanNOW.